Sure, most any boot jack can take your boots off, but will it look and feel this good doing it? 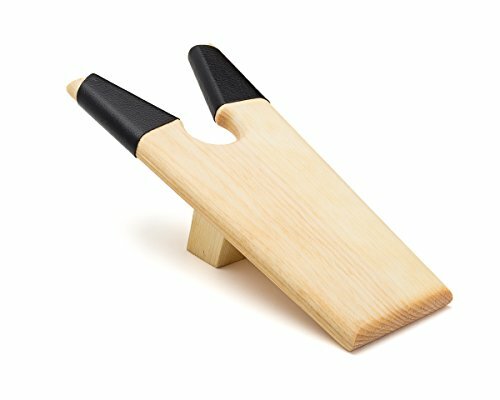 This Bootjack and Jill boot jack is not just a block of rough wood with a glued on base and haphazardly placed staples, it is a hand-made work of art. Rounded smooth edges, a base fastened with heavy-duty screws and leather boot guards attached on the bottom so as not to scuff your $800 alligator boots with a wayward nail, make this boot jack the easy choice among competitors. Plus, this product is manufactured in Canada, right on the border of the good old USA. And you know those Canadians aim to please. Don't waste your time on inferior products mass-manufactured on a another continent, only to come back and buy this one later. Save yourself the trouble and make the right choice now. Your boots and your back will thank you. BEAUTIFULLY FINISHED - Decorative and attractive with smooth, rounded edges to protect footwear and hands. Check out our other decorated designs for even more artistic appeal. If you have any questions about this product by BootJack and Jill, contact us by completing and submitting the form below. If you are looking for a specif part number, please include it with your message.